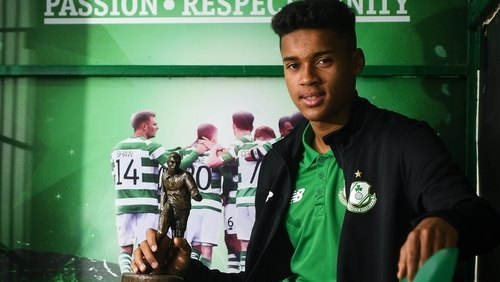 Talented teenage goalkeeper Gavin Bazunu has completed his transfer from Shamrock Rovers to Manchester City. The Dublin club agreed a deal to sell the 16-year-old last August, however, Rovers expected the player to remain at home until his Leaving Cert was completed this summer. But Rovers have confirmed that the keeper, who kept four consecutive clean sheets following on from his league debut last season, and also played for Rovers during their Europa League campaign, will now travel to Manchester following arrangements with his new club. "Shamrock Rovers FC can confirm that young goalkeeper Gavin Bazunu has completed his transfer to Manchester City," read a statement released by the Dublin club. "Gavin has completed the move earlier than we originally expected and we wish Gavin all the very best in his career development at City," said Sporting Director Stephen McPhail. "Whilst we originally planned for Gavin to stay at Rovers until July and see out his education to complete his Leaving Certificate at our education partner Ashfield College, arrangements have been made to accomodate Gavin doing his studies and moving to Manchester. "Working with Gavin, his family and the other parties involved we are happy that this is the best scenario for Gavin and for the football club." Meanwhile, Bazunu has been named in the Republic of Ireland Under-17 squad that will travel to Spain to play two international friendlies against Poland and Belgium. Head coach Colin O'Brien has named Bazunu in a 20-man squad for next week's double-header in Marbella. O'Brien's side play two games in the space of three days, as preparations continue for this May's UEFA Under-17 European Championship which is held in Ireland. Both Poland and Belgium are in preparation for the upcoming Elite Round qualifiers next month, and O'Brien feels both sides will provide tough opposition in Spain. "The games will be very competitive. I've no doubt that both sides are aiming to be in Ireland in May. That's the calibre of opposition we are looking for. It gives us more preparation time with the players," said O'Brien. "We want to look at players throughout the season. There are some new players in the squad and they have a chance to show us what they can do. They are players unlucky not to make the squad and they are still in consideration for May." Ireland travel to Spain this weekend, before the opening match on Wednesday, against Poland. Republic of Ireland Squad: Gavin Bazunu (Manchester City), Conor Carty (Wolverhampton Wanderers), Thomas Considine (Bohemians), Jimmy Corcoran (Preston North End), Matt Everitt (Brighton and Hove Albion), James Furlong (Shamrock Rovers), Anselmo Garcia MacNulty (Real Betis), Joshua Giurgi (Norwich City), Harry Halwax (Derby County), Joe Hodge (Manchester City), Brandon Holt (St Patrick's Athletic), Roland Idowu (Southampton), Sean Kennedy (Sunderland), Seamas Keogh (Southampton), Sean McEvoy (Ballinamallard United), Ronan McKinley (Derry City), Andrew Omibamidele (Norwich City), Toby Owens (Shamrock Rovers), Timi Sobowale (Manchester City), Luke Turner (Aberdeen). 13 February: Poland v Republic of Ireland, Stadium Municipal Marbella, 2.30pm (3.30pm local time). 15 February: Republic of Ireland v Belgium, Dama de Noche Football Centre, 2.30pm (3.30pm local time).